Got it! Satsfying trout catch. Nigel and I have had a couple of short evening sessions on the river this week. 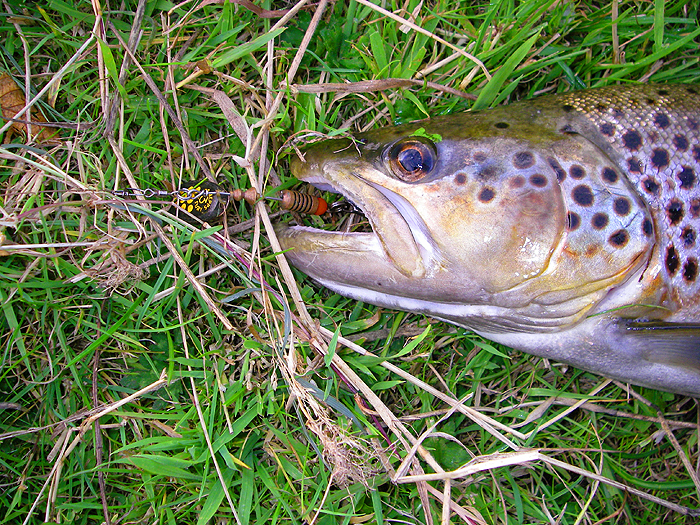 Initially he was keen to catch a grayling or two on the fly so he took the fly rod armed with a little gold-head nymph. The river is very low, clear and weedy at the minute so my choice of spinning with a big silver Mepps in the bright evening sunshine was probably stupid. Anyway, on our first evening I caught nothing although I did have my appetite whetted by a nice trout which had two or three go's at the lure downstream of a little gauging weir on the small millstream beside the main river. Each attempted attack was less vigorous than the one before - we all know that feeling eh? Nigel didn't manage to get his grayling but he did land a small fresh-looking salmon (he had a picture on his phone which I'll try to get from him and add to this report later). Apparently the salmon was not that lively but it was tricky to land by hand and he managed to get well nettled in the process. Two evenings later we tried again. This time my pal had decided that maggots on float gear were more likely to produce the required grayling so he took his trotting rod with a centrepin reel. I really fancied trying for the trout I'd seen before so this time I started with a J9 Rapala. Of course the trout didn't take but in the course of an hour or so Nigel did manage several grayling and trout on the float. He told me later that after I left he'd had one good grayling (over two pounds) and lost an even bigger one so he was well pleased. After a while I decided that my spinning was again futile, so I left him to it and set off to walk back to the car. 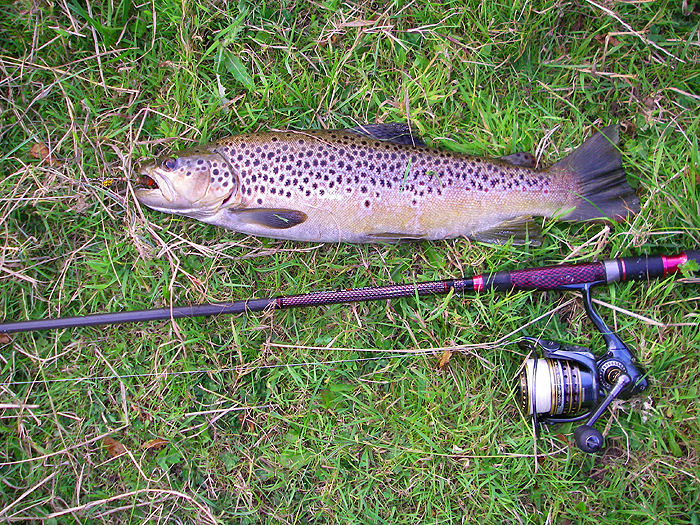 On the way I was passing the home of 'my' trout and by now the line was armed with a size 3 black Mepps spinner. Of course I couldn't resist a chuck so, standing by the weir, I flicked the lure downstream and let it swing in the current before winding it back - nothing! One last cast (there always is one isn't there?) further down the pool. This time I wound the lure back up right into the rushing white water below the weir until it was almost at my feet. It was pretty shallow with big moss covered boulders visible under the water. There was a sudden bronze flash and I was in. The reel screamed and the trout ploughed across towards the overhanging alder branches on the far bank. It was two or three minutes before I managed to gain some sort of control. I could see that to land the fish I would have to draw it into the small area of slack water alongside the race. This would mean stepping down off the brick wall and standing in the water. The plan sort of worked and soon the fish was almost to hand. I reached for the trace to try and steady the trout down (it was still lively) but it rushed away again and I had to play it back into the slack again. This time, at my second attempt, I managed to pick it up, lay it on the grass and clamber out to take its picture. No monster but round about the three pound mark. Very satisfying to catch what I was after. I slipped it back and watched it swim away, then I went home. Oh, I forgot to say that I had the Go-Pro camera on my head so the entire trout business was recorded on video and before that I'd managed some footage of Nigel catching trout and grayling. It is about time I put the camera to some use so no doubt I shall be doing it again soon. At last - my elusive trout. Nicely hooked on the little Mepps 'Black Fury'.